Click here to visit the edition website. CD 6: Beethoven: Piano Sonatas Nos.28 & 29 "Hammerklavier"
Concerto in E flat major "Dumbarton Oaks"
Les Préludes, S. 97 - "Symphonic Poem No. 3"
Concerto in D Major for String Orchestra "Basle"
"Se a caso Madama la notte ti chiama"
"Or bene, ascolta, e taci"
"Se vuol ballare, signor Contino"
"Ed aspettaste il giorno fissato a le sue nozze"
"Via resti servita, madama brillante"
"Tutto è come io lasciai"
"Esci, ormai, garzon malnato" - "Susanna!... Signore!" "Io vi dico, signor" - "Cosa mi narri!" "Queste sono, Madama" - "Eh cospettaccio!" - "Signor, se trattene"
"Barbarina, cos'hai?" - "Madre... Figlio." - "Presto, avvertiam Susanna"
"Il capro e la capretta"
"Perfida! e in quella forma meco mentia?" Quintettino op.30, No.6, La musica notturna della strade di Madr. CD 34: Rimsky-Korsakov: Scheherazade / Tchaikovsky: Capriccio; Overture "1812"
Symphony No. 3 in C Minor, Op. 78, R. 176 - "Organ Symphony"
Le Déluge, Op. 45 - "Poème biblique"
Zärtliche Liebe, WoO 123 "Ich liebe dich"
CD 45: Tchaikovsky: Symphonies Nos.5 & 6 "Pathétique"
"O tu che sei d'Osiride ... Vieni d'Iside al tempio"
Coro di Streghe: "Che faceste? dite su!" "Della mia bella incognita borghese"
Scena ed Aria. "Gualtier Maldè ... Caro nome..." - "+ là..." / "Miratela"
"Zitti, zitti, muoviamo a vendetta"
"Duca, Duca! L'amante fu rapita a Rigoletto - Ebben?" "Mio padre! - Dio! - Mia Gilda!" "Chi è mai, chi è qui in sua vece?" 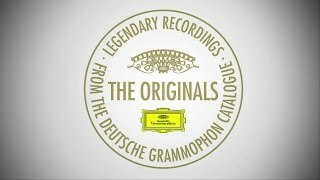 Deutsche Grammophon is proud to present “The Originals - Legendary Recordings Vol. 2”. This 50 CD-edition features the bestselling albums from THE ORIGINALS series and highlights the key artists and recordings from DG’s LP-era: https://www.deutschegrammophon.com/ori... In 2014 Deutsche Grammophon celebrated the 20th anniversary of its flagship series, The Originals, with a limited edition collection featuring some of the label’s greatest albums. This second volume concludes the label’s survey of its iconic series by presenting more legendary albums. Including key recordings such as Beethoven’s Late Sonatas with Pollini, Berlioz’s Symphonie Fantastique with Markevitch, Brahms’s Hungarian Dances with Karajan, Dvořák’s “New World” with Fricsay, Chopin Préludes with Argerich, Respighi’s Fontane & Pini di Roma with Karajan, Schubert’s “Great” C major Symphony with Furtwängler, the Schumann Piano Concerto with Richter and Dichterliebe with Wunderlich, Stravinsky with Boulez, Verdi Choruses with Abbado and many more. Also featured is the complete Brahms Symphony cycle with Jochum as well as three complete operas: Böhm’s Le nozze di Figaro, Rigoletto with Giulini, and Der Freischütz under Carlos Kleiber. “Connoisseurs of classical music get glints in their eyes when they see the covers and contentedly whisper the old LP order numbers” – what was written about THE ORIGINALS in 1995 has been confirmed by over 20 years of continuing success.